No, I haven’t taken up building miniature models of Tuscan towns. 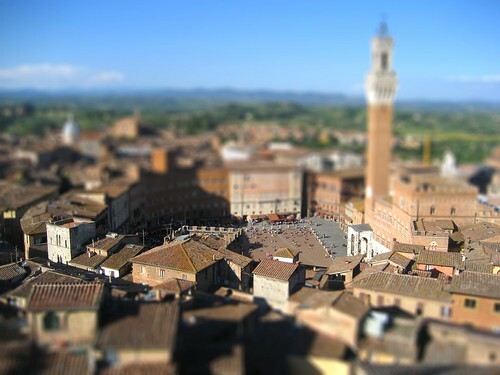 This is a digitally processed version of a photo I took in Siena on vacation 2006. Is it convincing? Enthusiasts have been playing around with tilt-shift miniature faking for a while, but the website TiltShiftMaker makes the process easy as pie. I think that the people in the square hurt the illusion. The buildings are ok, but I can't imagine anyone making a miniature with such small-scale humans. Pretty cool, though.